The Bald Cypress bonsai is a great choice for those new to the art of bonsai. You can purchase starter trees or, if you have a bit of experience, use a small tree harvested from nature. Whichever you choose, you can be assured of a rewarding hobby that will connect you to nature in ways you have never imagined. Once you have decided to grow a Bald Cypress bonsai, you will need to decide how to acquire it. Do you want to start from scratch with a seeding harvested from nature? Would you rather begin with a starter tree that is already well on its way to becoming a lovely work of art? Here is some information that may help you to decide. If you plan to really start from scratch, you can select the tree you feel is best to shape into a work of art. Bald Cypress can be found abundantly in the southern parts of the United States so locating one in the wild can be fairly simple. If you live in an area that is not common for this tree to grow, or if you just can't find a good specimen, you can also check out local nurseries or garden centers to find a young tree that will meet your needs. Look for a tree with a tapered trunk. A tall, young tree is fine as long as you have some understanding about how to begin the cutting process. Ideally, you should buy or harvest your tree in late winter or early fall so it will be dormant when you do your first trunk chop. When deciding where to cut the tree, use the formula of the height being six times that of the width of the base. It may appear that you are removing all of the growth of your tree but don't be concerned. Your Cypress tree will bud out vigorously although it may take longer than other trees. Just be patient and you will see that it is worth the wait.You will also need to cut the taproot and trim the rest of the roots at this time. After you have made your cuts, plant your tree back in its original pot. It will require about two years of careful nurturing and pruning before it can go into a bonsai pot. You can save a bit of time if you purchase starter trees. 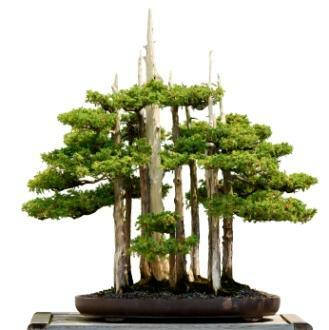 This will also eliminate the anxiety associated with making those first cuts if you have little experience with bonsai. Starter trees can be purchased individually or in groups. A group can be used to create a miniature landscape. Plant them to resemble a stand of Bald Cypress the way they occur in nature: a circular stand that appears like a mound with taller trees in the center and smaller trees around the outside. One place to purchase these starters is Bonsai Wholesale. While you are there take a look at the rest of their inventory of bonsai supplies. Bald Cypress bonsai prefers to be in wet, swampy soil. You can provide this by keeping the pot filled almost to the pot's rim with water. Use a watering can to simulate rain and water from above the tree so it gets wet along with the ground it is in. During the hot summer months you may find that it needs to be watered up to twice a day. This type of tree prefers full sun and, like most bonsai, does best when it is kept outside. This is a tree after all, even though it is in miniature. It may tolerate being indoors, but outdoors it will truly thrive. Expect to fertilize your bonsai tree weekly in the spring. By late summer through fall you will need to decrease fertilizing to every two weeks. As winter approaches you will need no fertilizer as your tree goes dormant until the following spring. Use a balanced (10-10-10) fertilizer to provide the proper nutrients. The art of bonsai is very complex and impossible to teach in one short article. If you want to pursue this hobby, it is very rewarding but does require patience as the trees take years to grow to their final form and need constant care. Beginning Bonsai will give you all the basics to get started in this hobby. The Complete Book of Bonsai is another fantastic resource. Bonsai Basics is an excellent step-by-step guide to this enriching form of art.